The photo below shows a bus boarder on Wood Street. Bus boarders are designed to deter drivers from parking unlawfully at bus stops,obstructing them. The reasoning is that drivers won't park in locations which obstruct other motor traffic, and so the footway is extended to narrow the carriageway. The idea works but at a price. The objection to bus boarders of this type is that by building out the footway, cyclists are forced into the path of drivers. At a location like this (which faces in the direction of Whipps Cross roundabout)traffic speeds up after the congestion between Wood Street station and Forest Road. A survey taken at this point would undoubtedly reveal that large numbers of drivers were breaking the 30 mph speed limit. Apart from that there is the problem of inattentive drivers who are chatting on hand held mobile phones. 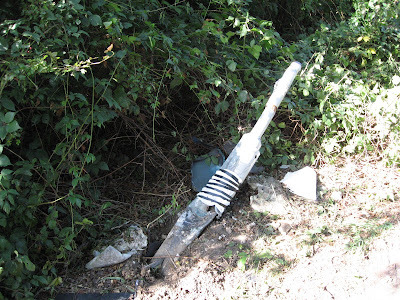 Note that the plastic bollard has received a bash, presumably from a carelessly-driven vehicle. In short, the physical lay-out of the street is engineered to accommodate selfish, lawless parking (which would be much better dealt with at bus stops by a large fine and penalty points for persistent offenders)and in so doing it makes cycling more dangerous. Incidentally, no prizes for spotting the anomalous street furniture. Ah, yes, cutting edge Orient Way. The photograph below is a bit symbolic of something, wouldn't you say? I think the word we're looking for here is neglect. The design here (below) is particularly impressive. 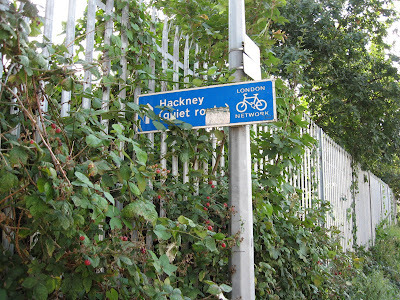 The walkway is not simply obscured by ivy but an advertising board has been placed across it, put there with the permission of the Council. 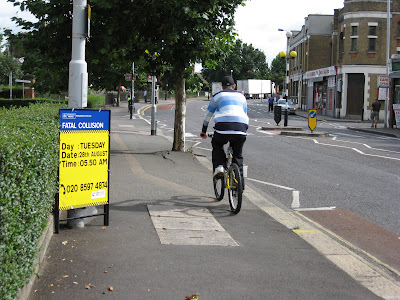 As pedestrians step round past the board they run the risk of meeting a cyclist head on. Brilliant. And what woman cyclist on her own wouldn't want to descend into this jungle of darkness? Who needs to watch horror movies when you can experience acute nervous anxiety on Orient Way, wondering what lurks round the corner in this lonely location out of sight of anyone? 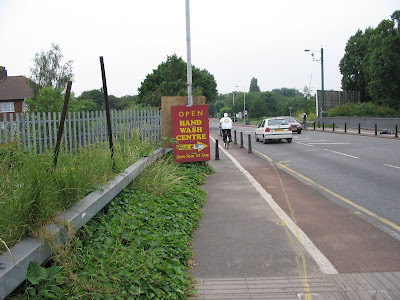 Finally, if you survive Orient Way, you can emerge on to Ruckholt Road (below), hoping that none of the speeding drivers coming up behind you will crash into you as you leave the off-road cycle lane and enter a totally unprotected cycle lane in the road. 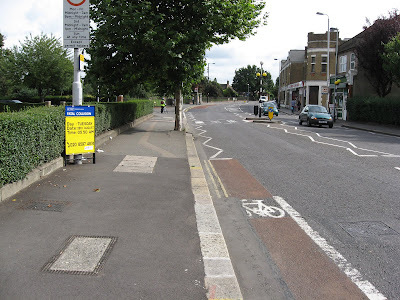 The staged photo in the brochure shows a cyclist heading towards Hackney down Lea Bridge Road. The reality is a little different on other parts of this route. If you look very carefully you'll see that in the opposite carriageway there's a cyclist approaching who prefers to ignore the cycle lane and instead is using the carriageway. The later photos will show why. 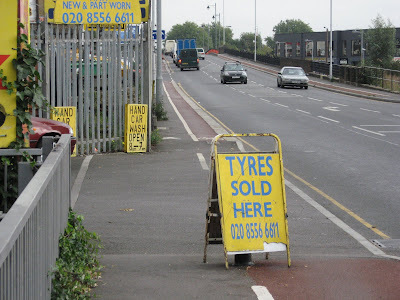 Below: a commercial sign is illegally positioned across the cycle lane. It is there day after day, week after week, month after month. No one in this crap Council cares. Approaching Orient Way the cycle lane shrinks to an impossibly slender section (with occasional obstructive clutter, as shown). What narrows it are blocks of wood. These are not temporary roadworks - these blocks have been here for years. They are put there to deter HGVs from parking on the bridge. The same blocks can be found on bridges over railway lines around the Borough. Apparently these bridges require strengthening and no one will take responsibility. The Council says it's Network Rail's job, and they say it is a local authority responsibility. In the meantime only cyclists and pedestrians are inconvenienced, so obviously there is no urgency at all. I expect these bridges will finally only get strengthened when one of them collapses and kills people. Dyson Road, E11. A fence panel with nails sticking out of it. Let's hope no blind pedestrian walks this way. The Council used to have a freephone CLARENCE hotline for residents to phone up and report stuff like this. But then they phased it out, to save money. Now you have to phone the Council's main switchboard, listen to an interminable sequence of recorded messages, then speak to an operator, who puts you through to an extension, which no one answers. Or they do answer and you then get mysteriously cut off. And so you have to start the process all over again. All at your own expense. Is it any wonder that people don't bother? The hypocrisy and impudence of the Council's advice that residents should "go car free" and "try cycling instead" is nowhere more blatant than in the little matter of cycle stand provision. 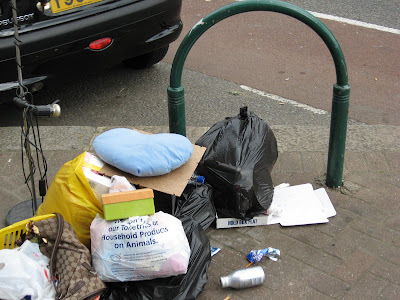 All over the Borough there are council-owned properties used on a daily basis by members of the public which lack even a single cycle stand. But wait! Didn't the Council install an extra 5 cycle stands near the High Street entrance to Bhs? Yes, it did. 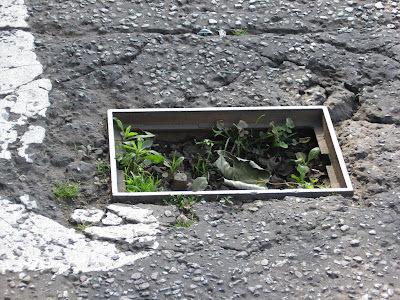 It employed contractors who didn't install them in the ground deeply enough. No sooner were they in place than one by one they started coming loose, like rotten teeth. Ah, but surely an efficient local authority would take note of this and get the contractors to come back and do the job properly? Yes, it would. But this Council is more interested in Greenwash than practical action. If you look at the photograph below look at the white patches on the ground - that is where four of the five racks used to be. I shan't be at all surprised when the last one goes. 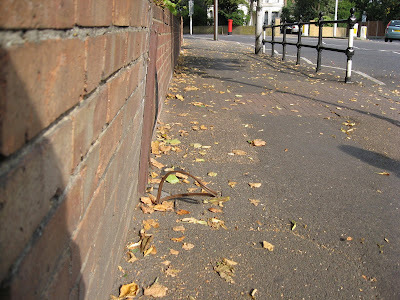 And this isn't the only place where cycle stands have simply vanished, never to be replaced. There used to be three outside 530 Forest Road. 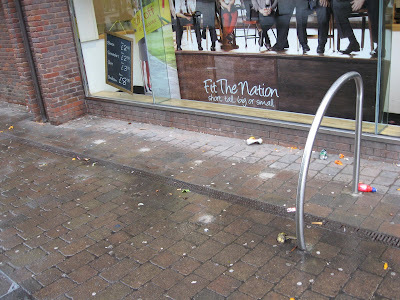 They've simply vanished and now there is no cycle parking for anyone shopping there. 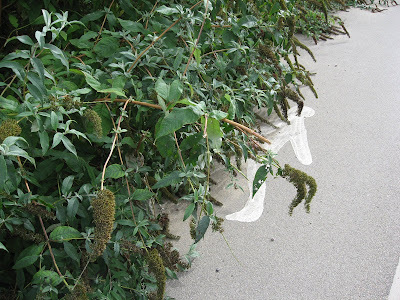 There used to be three on Vernon Road E17; one has vanished without explanation. There used to be a stand on Rosebank Villa. It was removed during resurfacing and never put back. There used to be one on Hoe Street opposite the Victoria pub. It was removed during resurfacing and never put back. There used to be one in the High Street to the right of the old library entrance - now all that's there is a litter bin. There used to be one at the High Street entrance to the shopping Mall - that was taken away when the entrance was revamped after the fire. There used to be three cycle stands in the Town Square, just past the Nat West. They were new stands and hadn't been there all that long. All three have collectively vanished without explanation or logic. That's a grand total of 15 cycle stands which have been removed. 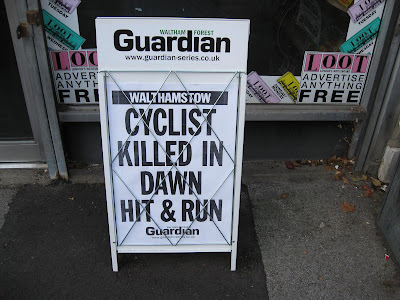 And quite plainly no one in the London Borough of Waltham Forest has either noticed or gives a damn. The London Borough of Waltham Forest - where walking down the street holds out the possibility of being a truly electrifying experience. 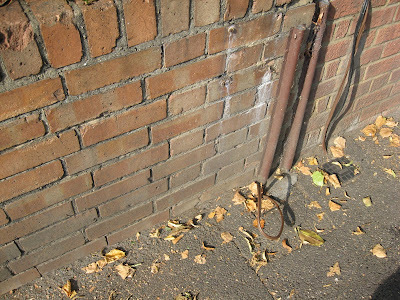 On Church Hill E17, across the road from the school, a cowboy electrician has thoughtfully left a loop of what is evidently live electrical wiring protruding from the footway. How ironic that it's just two metres from the studs designed to help blind pedestrians who use the zebra crossing. It's not only the sort of thing that someone could easily trip over but also holds the potential to give someone a surprise injection of voltage. And note how beautifully camouflaged it is to blend in with its surroundings. 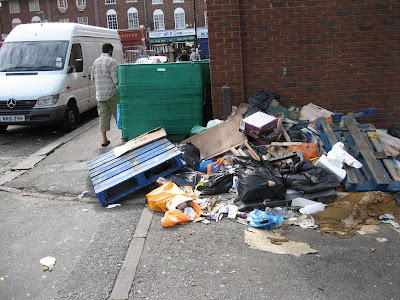 The state of local footways - what you might call shocking. 'One in three car journeys are less than one mile! If we can, why not try walking or cycling instead?' gushes the latest issue of wfm. Why not? Perhaps because in a car you would never expect to find the road surface collapsed with several inches of rusting metal sticking out to shred your car tyres. 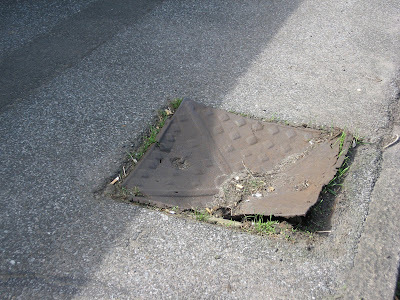 Whereas pedestrians in the London Borough of Waltham Forest can expect to find trip hazards like this - a broken utility cover which protrudes above the footway surface with several inches of rusting razor-sharp edging. It's been like this for so long that grass is growing out of the damaged cover (look at the crack in the plate in the top right corner). Why not try cycling? asks the latest edition of the Council's newspaper wfm. 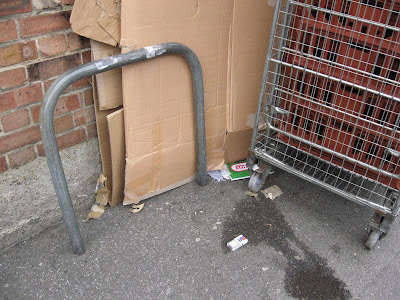 Why not, when at the end of your journey you can find top class facilities like this cycle stand, just off Walthamstow High Street, photographed at lunchtime today. Who wouldn't want to lock their bike to this superb facility, which comes complete with a pool of urine. And, yes, that is Mission Grove primary school in the background. 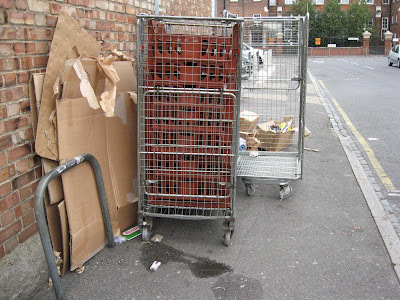 But don't try getting there with a double buggy, because with all the rubbish the available footway width isn't wide enough. 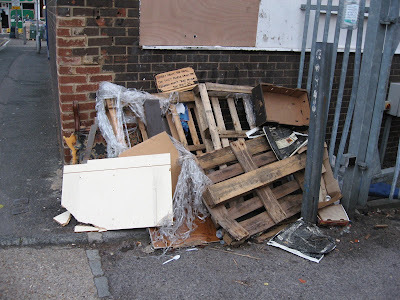 Super to see that local traders are committed to recycling cardboard though. 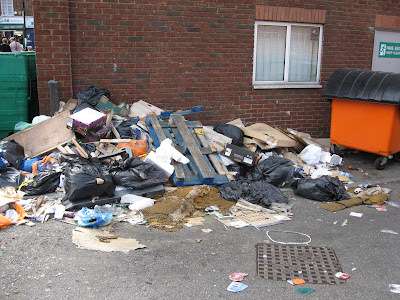 "We will take effective enforcement action against fly-tipping and the accumulation of rubbish on private land." 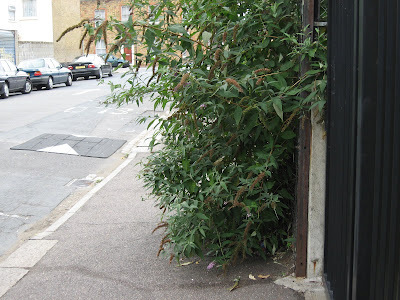 But not on Westbury Road E17, where a local resident can be seen strolling through our attractive town centre. This photograph was taken this morning, close to the junction with the High Street. 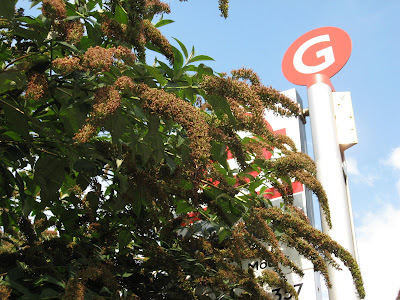 In the real world (as opposed to the fantasy world of this Council's Green propaganda) a bus stop in a prominent location on Hoe Street is allowed to become totally obstructed by overgrown vegetation. And which landowner is responsible for not cutting back this growth? That's right - the London Borough of Waltham Forest! 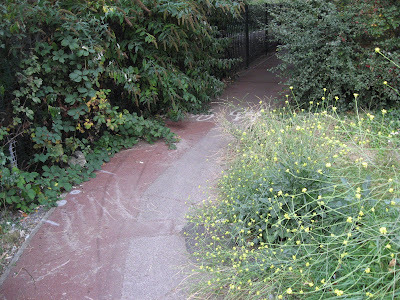 Vanished markings, broken glass, overgrown vegetation - it must be the London Cycle Network! Forest Road (A503) approaching the lights at the junction with Woodford New Road (A104). What is wrong with the picture below? I'll tell you. 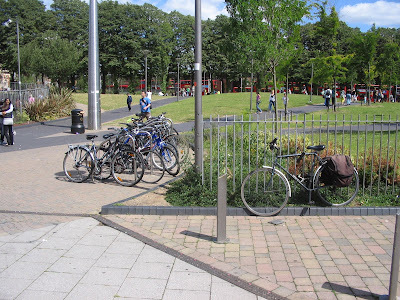 Beyond the third kerbstone is a dropped kerb which marks the beginning of an off-road shared use cycle lane. But when contractors resurfaced the footway they didn't bother to reinstate the markings. 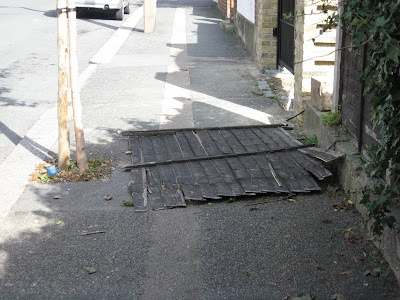 And obviously no one from the London Borough of Waltham Forest bothered to check that the job hadn't been done properly. Further on, beyond the cattle gate, it gets worse - much worse. By the way, all these photographs were taken today. The photograph below was taken looking back down Woodford New Road in the direction of the junction with Forest Road. 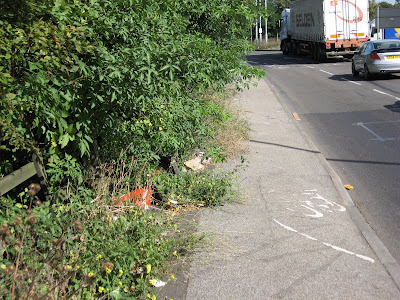 It is, of course, a scandal and a disgrace that any part of the London Cycle Network is ever allowed to get into this state. 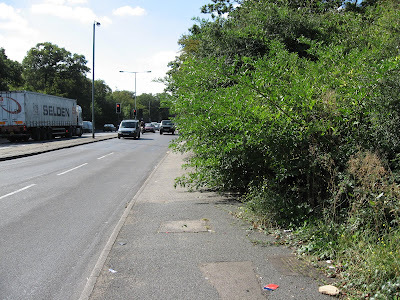 The landowner guilty of not cutting back the vegetation is the Corporation of London. The London Borough of Waltham Forest has the legal power to make the Corporation take action but shows no willingness to do so. Going down the cycle lane which descends into the subway system I was surprised to see that a vehicle going round the roundabout had recently careered off and crashed through the railings, on to the off-road cycle lane. The photograph below shows where the vehicle left the road. Apparently a Ford Fiesta and a Renault Clio collided at the roundabout just after 6 p.m. on Sunday 9 September. One of the vehicles overturned (perhaps the one that crashed on to the cycle lane). 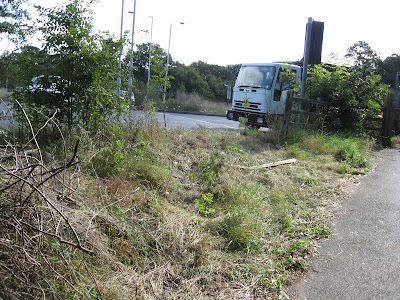 All the vehicle wreckage had been removed - except for some miscellaneous rubbish strewn across the cycle track (below). 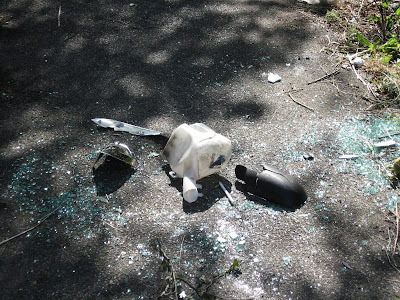 It included what seem to be the remains of a shattered windscreen. That's right - broken glass, lots of it, completely covering the full width of a route used by cyclists and pedestrians. No one from the Council has been along to clean it up. But then it doesn't really look as if anyone from the Council has been near this cycle route for donkeys years. 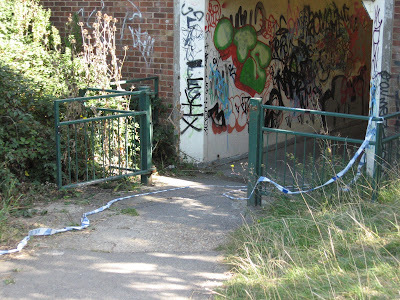 And finally, having negotiated all the obstacles, cyclists are free to enter the filthy, graffitti-spattered, rat-inhabited underpass system (below). But take care - be careful you don't get those wheels tangled in the blue and white litter left behind by the Metropolitan Police. By the way, the person who is accountable for this state of affairs is the cabinet portfolio holder for the environment, Councillor Bob Belam. If any of the photographs on this blog engage your interest, why not get in touch with him? Please be polite. Home Address: 92 Douglas Avenue Walthamstow London E17 5BW. Home Phone: 020 8923 1148. A top class cycle route! 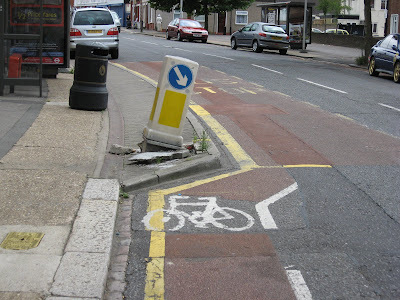 Signs for cyclists, as you can see, are in a superb condition in the London Borough of Waltham Forest. As for the road surface recommended to cyclists... well, as you can imagine, no one seems to have been near it for years. Not only is the cover plate missing from this utility hatch(below) but an interesting wildlife reserve has been created inside it. Cranbrook Mews, E17. "We will improve the street environment for pedestrians by ensuring the provision of unobstructed, well lit, well surfaced and well protected footways." Green Charter, page 12. 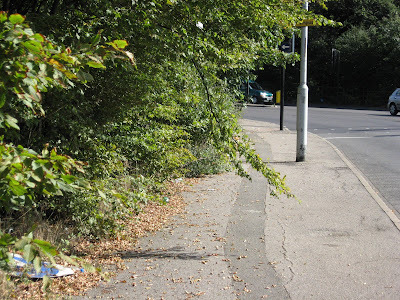 In reality, obstruction of pavements by overgrown vegetation is commonplace throughout the Borough. Today's example is Russell Road, E10. 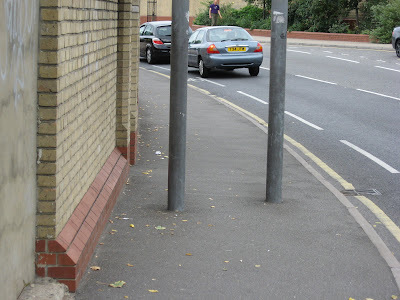 The concrete post marks the inside of the footway. 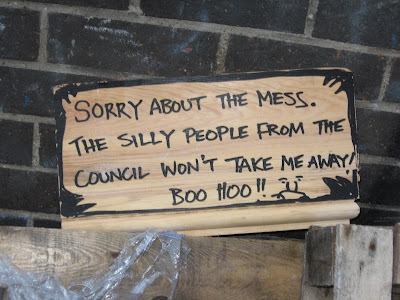 I spotted this sign today on Cleveland Park Avenue, E17. London Borough of Waltham Forest Green Charter, page eleven. 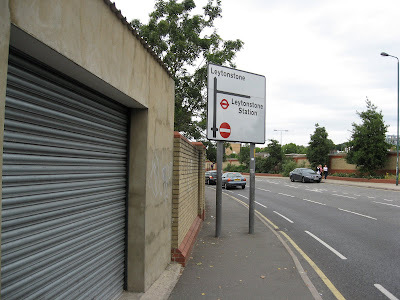 Since those words were printed in that worthless document, the Council has installed this hideous sign on Grove Green Road E11. 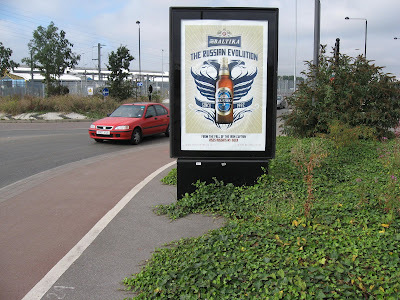 It is entirely aimed at drivers and is of no interest to pedestrians. The sign is obstructive and presents a real problem for someone in a wheelchair or with a double-buggy. A better example of ugly clutter would be hard to find. The Green Charter is crap. 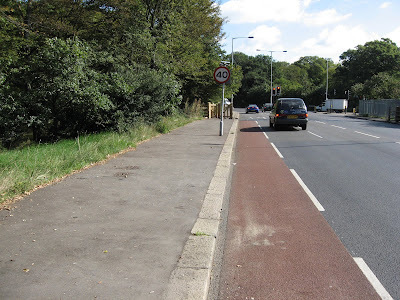 Below is the site where a 46 year-old cyclist was knocked down and killed on his way to work a week ago. The fatal collision happened close to the junction with Winns Terrace E17. The photograph below shows the location (Winns Terrace is just beyond the zebra crossing, on the left). The car was apparently driving on this side of the road, heading towards The Bell. It seems clear from the force of the impact that the driver was well over the 30 mph speed limit. Although unlikely to have been a factor in the crash, note the poor state of the cycle lane. 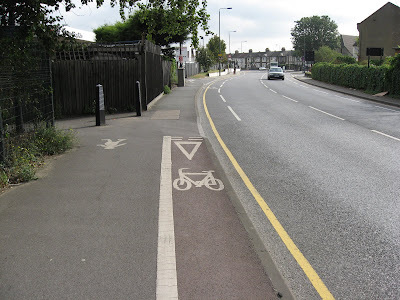 It is noticeable that markings which affect cyclists and pedestrians are allowed to deteriorate in a way which would never be regarded as acceptable for motor traffic. 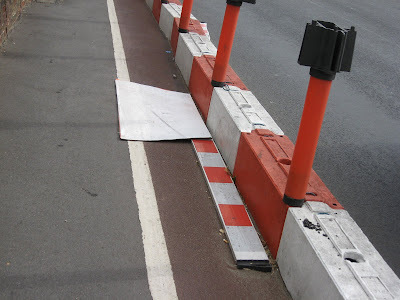 While I was taking some photographs at the site, a cyclist whizzed past me on the pavement (photo below). 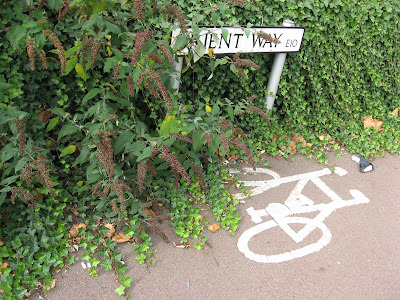 Cyclists tend to ride on the footway when they perceive the carriageway as being too dangerous to cycle on. The dangers at this location are twofold, I think. The main problem is excessive speed. The number of drivers who break the speed limit every day on Forest Road must run into the thousands. 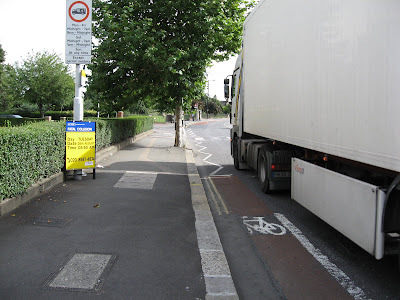 A second problem at this location is that large vehicles drift into the cycle lane as their drivers instinctively move to avoid the traffic island in the centre of the road. 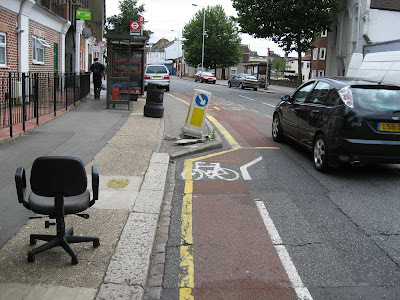 The photograph below indicates why some cyclists might think it safer to ride on the pavement here. ...is in High Road Leytonstone, just across the road from the fire station. 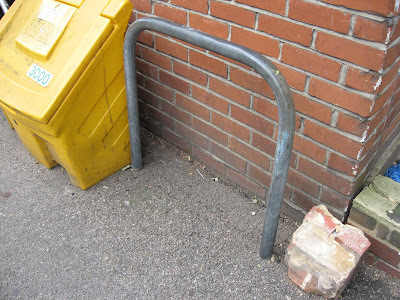 You could also ask Councillor Bob to justify the proliferation of these yellow grit bins in the Borough's streets. They are NEVER used to grit the streets in the winter and seem to serve no other purpose than to advertise discount salt on sale by the Council. But when did you ever meet anyone who'd bought salt from the Council? For the record, the pic was taken this morning outside the Walthamstow High Street branch of the Nationwide Building Society. 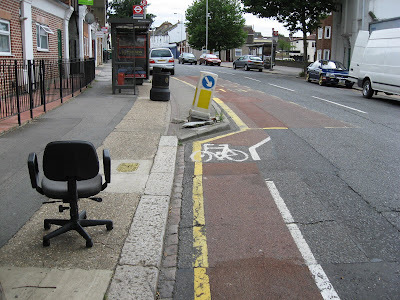 These are the cycling stands between Fish Bros jewellers and the empty Burger King site in Walthamstow High Street. 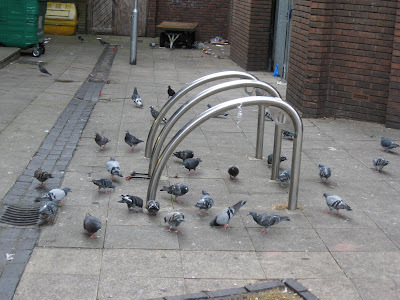 There are at least two women who come along regularly and throw sacks of breadcrumbs over the cycle stands, to feed our feathered friends. I have even see one of them do it when there are bikes locked up here. Might I modestly suggest that a sign be put up here: DO NOT FEED THE PIGEONS.